1. Rub softened butter around the 12 non-stick muffin tins. Coat the tins with breadcrumbs. 2. Remove the peel from the potatoes and discard. Cut the potatoes into a large dice. Place in the muffin tins. 3. Place the ham and cheddar cheese in the muffin tins. 4. In a large bowl, mix the eggs, milk, black pepper, salt, basil, and green onions. Pour into the muffin tins. They will be very full. 5. Place the muffin tin pan in a 350 F oven and bake for 20 minutes. 6. 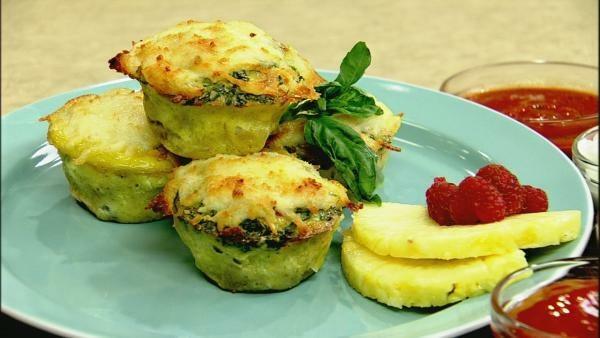 Sprinkle the mozzarella cheese on top of the 12 "muffins" and return to the oven for another 5 minutes. 7. Remove from the oven and eat or let cool. Once they are cold, keep them in a covered container in the refrigerator until needed at which point they can be warmed in the microwave. Serve with different sauces as desired.